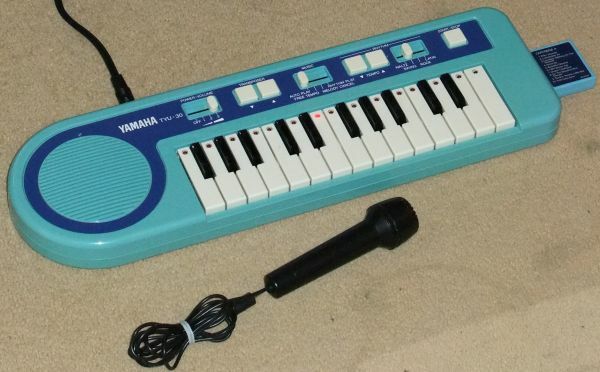 The Yamaha TYU-30 is essentially a cut-down version of the TYU-40, but with a "Music Cartridge" slot instead of the "Music Card" slot. The TYU-30 lacks a pitch bend wheel and has only three volume levels, but otherwise the two models are identical feature-wise. 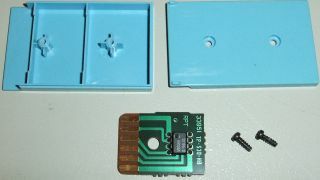 Unlike the "Music Cards" supplied with the TYU-40, the "Music Cartridges" actually contain a real ROM with stored music data, and slot into the right-hand side of the rather fetching turquoise keyboard. Songs are selected for playback in the same way, by holding down the relevant numbered key while tapping the Start/Stop button, and sound very similar to the TYU-40's Music Card orchestrations. The same training modes are also available. Two Music Cartridges were supplied with the TYU-30, and it seems unlikely that any additional after-market cartridges were made. I have never seen any. It should be noted that the Music Cartridges used by the TYU-30 are completely different from those used by some PSR range keyboards made around the mid to late 1990s. Many of these later Music Cartridges were made, but they are not compatible with the TYU-30. The TYU-30 sounds very slightly "brighter" and clearer than the TYU-40, particularly the percussion sounds, presumably because there is less agressive filtering of the output. The built-in speaker is surprisingly good, but an aux output is provided. Oddly, this is a mono 3.5mm jack, so only plays through one speaker if connected to a stereo system. The TYU-30 is a lovely-sounding little keyboard, but it's a pity there are no additional Music Cartridges. The Operating Manual for the TYU-30 can be downloaded from the Yamaha Manual Library. Here's a picture of a dismantled Music Cartridge for the TYU-30. Click the picture for a high-resolution version. Unsurprisingly, there is just one IC, and the outer package is much larger than it really needs to be.